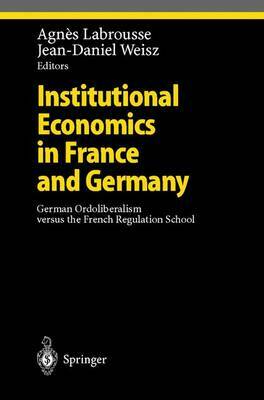 German Ordoliberalism and French Regulation theory, two institutionalist theories born in different national contexts, show striking convergences and complementarities. Based on an original comparison, Institutional Economics in France and Germany analyses the basic concepts, the development and the present relevance of both schools, the way they deal with the crucial methodological issue of complexity and with transformation in post-socialist Europe. It underlines the specificity and fruitfulness of these European approaches to institutional economics, often unfortunately ignored in the English-language literature. Written by leading scholars, this book is a clear presentation of both theories, with numerous illustrations and in-depth analysis of recent research developments. This theoretical, methodological and thematic comparison raises central issues in the growing field of socioeconomic and institutionalist theory.